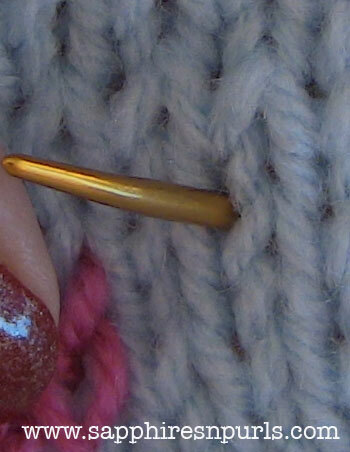 Here is a video with some basic info on using circular needles to knit in the round. 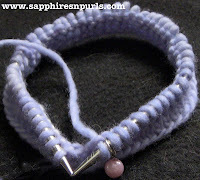 Two different ways you can join to begin working in the round, and if you accidentally begin knitting with a twist in the stitches, you can easily fix it on the first round. Use this technique for hats, bags, sweaters and more. 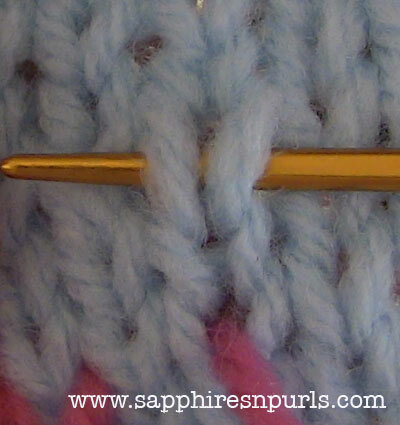 If you have never used circular needles for knitting in the round, I encourage you to try. It is not hard to do, but like everything else, will take practice and patience to become proficient. You can get circular needles in many lengths, sizes and materials. More on that here. 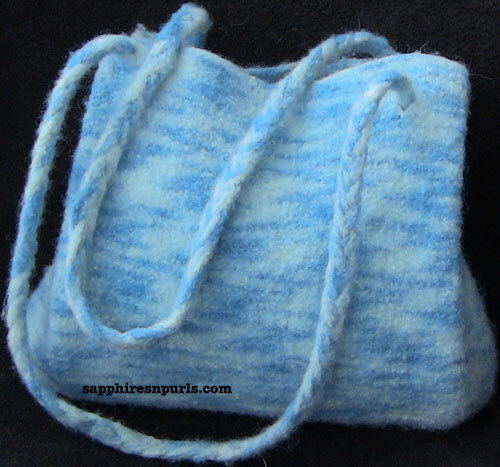 I wanted to take a quick look at felting in this post. 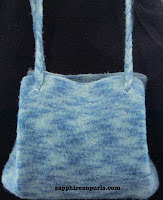 I've made a few felted bags and hats in the past, and always have fun. You can make hats, bags, hot pads, cat/dog beds or mats, and lots more. I have never followed a pattern, but rather just cast on, knit, and then felted. My projects have always turned out well. Luck, I guess! I made a short video of how I felted the piece of knitting above. My typical method is to just run my project through the wash with a small load of laundry, using hot water and a short to medium long cycle. Rarely do I stop the machine to check progress. I do recommend you check your item about halfway through to see how it is coming along. The old 'Do as I say, not as I do' bit. If my item is not felted enough to my liking, I leave it in for another round with the next load. The yarn is some that I dyed myself. It started as a neutral/ivory color, from Patons. I forget the needle size used, sorry. I cast on 34 stitches, knit for about 50 rows. This was about 7.5 x 5.5 prior to felting. It came out at about 6 x 5. Place the item you want to felt into a pillow case. A lingerie bag is sometimes suggested, but the lint/fuzz can still get out of the bag, and if you felt a lot, the lint will build up and ruin your machine. A pillow case will collect most of the lint. You can just throw in a pair of jeans or two to help agitate your project and help the felting process. Don't use new jeans though, because the color could bleed and get onto your project. (You know, like when you accidentally put a new red T-Shirt in with something white....) Better to use old jeans. Some people suggest using towels - I do not. Towels give off lint/fuzz pills of their own, particularly if they are newer, and it could stick to your project. Older towels may not pose much of a problem, so you may be fine to use old towels. Detergent helps the felting process, so if you are washing some laundry, of course you will already be using some. If you are just felting with a pair of jeans or two for the agitation, go ahead and put a small amount of detergent in. Not all yarns will felt in the same way. Some may felt faster than others, some may shrink more or less. 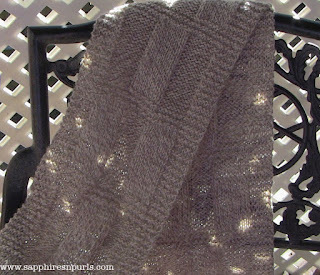 Your best bet is to knit up a test swatch and felt it to see how the yarn reacts. 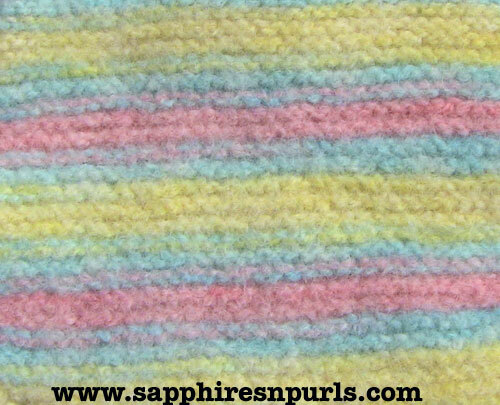 You will need to use an animal fiber for felting, as acrylic yarns will not felt. Animal fibers have scales, which open up when exposed to hot, soapy water; with agitation, these scales become tangled together. The scales close up and remain locked together as the fiber cools down and dries, creating felt. You may have some difficulty felting white yarn; sometimes these yarns have gone through a bleaching process, which removes the scales from the fiber. No scales, no felting. 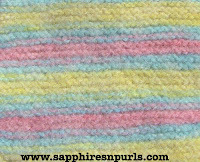 Again, your best bet is to do a test swatch, or even ask around for advice from frequent felters. Try the boards at Knitting Paradise, for example. Interweave has some felting magazines, and there is even an Australian magazine called Felt you may want to check out. And of course, the famous Booga Bag by Julie Anderson of Black Sheep Bags! Here is a cute little bag I made several years ago. I also did one in pink. The yarn is some that I purchased on eBay from forestgreener. Great seller that I have purchased from often. I always love the yarn, and have never had a problem with this seller. There is no pattern for this bag; I encourage you to create something unique for yourself. Here is the video. Happy Felting! 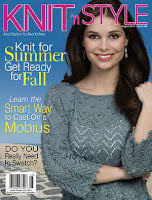 I first learned of Scribble Knitting in the August 2012 issue of Knit'n Style magazine. There is an article by Lorna Miser, describing some different techniques of Scribble Knitting, along with a pattern for a cowl. The basic idea is that you use two vastly different weights and textures of yarn; work so many rows in one yarn, then a row or two of the different yarn to create the 'scribbles'. The second, contrasting yarn must be carried up the side when not in use, and on some rows, it is necessary to slide the fabric back to the opposite side of the needles so that the correct yarn can be picked up and knit with. Because of this, circular or DPNs are used in Scribble Knitting. I had to try this out for myself of course. At the yarn store, I chose my first yarn: Crystal Palace Merino. I asked the shop girls for advice on my second yarn. It was suggested that I use a ribbon yarn. However, as they did not have any ribbon yarn, and I don't care much for it to begin with, I decided to go with some luscious Malabrigo Worsted. Also, I don't like to follow the rules, and wasn't looking to make anything too outrageous. I wanted something I would actually wear in public. And again, not liking rules that much, I did my project a little differently than any of the methods described in the magazine. Once home, I started on my project, and knew I had made the right choice in yarn. I love my wrap/extra large scarf. Although it is very light and airy, it is pretty warm. It is perfect! I can't wait to play around with some other types of yarn and see what else I can come up with! Here is a picture of my project, and the pattern is available for purchase in my Craftsy store. Due to the plethora of requests I have had for the green scarf shown in my How to Knit a Scarf video, (ok, not a plethora, but a lot!) I have finally sat down and written something up. It is not quite exactly the same, but pretty darn close. 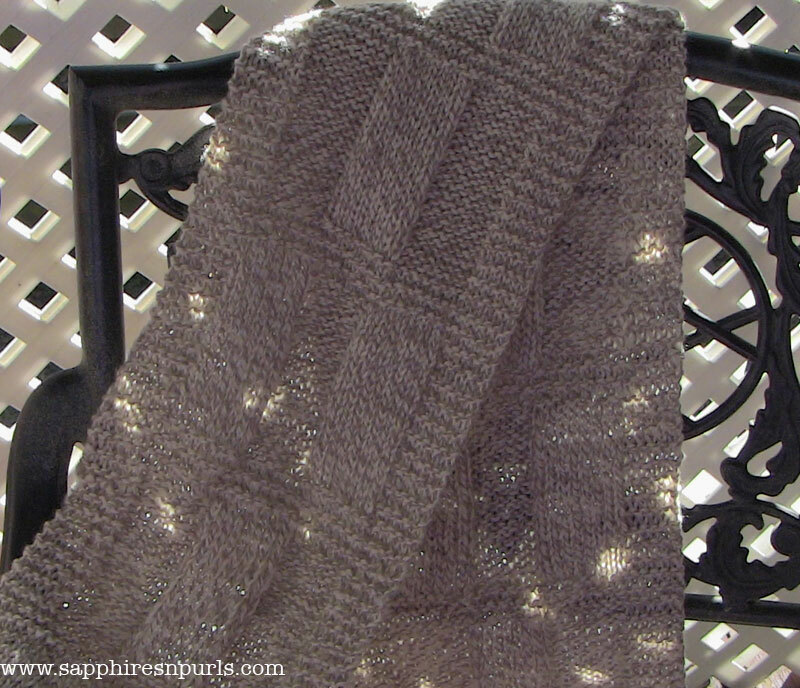 I could not locate the yarn used in that scarf, but the Patons Classic Wool I chose for the pattern is very nice. The pattern is available for purchase in my Craftsy Store. If the Spit Splice or Russian Join aren't your deal, try just picking up your new yarn and knitting it in. I like to do this if at all possible at the beginning of a new row, because it seems a bit neater for me, and is easier for me to weave in the ends of the old/new yarn. Sometimes, however, it may be necessary to join somewhere else along your row. This is fine. This is how I do it: Wrap the tail of the new ball around my finger to keep it out of the way, then, holding the tail from the old ball and the working yarn together, knit 3-4 stitches. Drop the tail and continue knitting. Remember on the return row you will have what looks like two stitches where you knit with both the old tail and new working yarn. Be sure you knit these together as one stitch, otherwise you will be increasing your stitch count. Weave in loose ends, and you are good to go. Here is a video. Happy Knitting! Yes, it took me four years to knit this sweater! But I finally finished last night. Right now it is drying outside. I gave it a little bath in some SOAK, rolled in a towel to remove excess water, and then put it onto another towel to pat into shape. I guess I did ok for my first sweater! 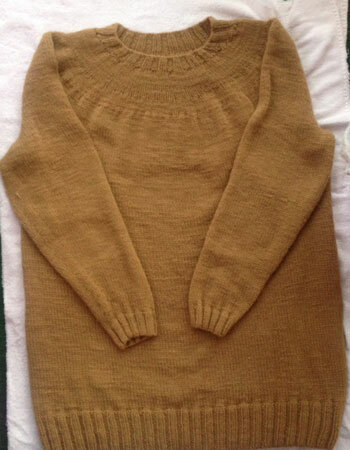 My tension got screwy in the yoke/neck area, it is looser than the rest of the sweater. Not sure what happened there. I can clearly see the decrease rounds, and that bothers me. I also don't like the bunching, and don't know why that happened. I was hoping it would be nice and flat like the body. Blocking has helped a lot though. I made the body longer than sweaters typically are, since the recipient requested it be done that way so when he bends over, .... well, you know! I am happy this project is done, I learned a lot. Especially that I don't care for knitting sweaters, and most likely will not make another one any time soon. I made this with Cascade 220 using EZ's percentage method in the round. It was really easy, and I am glad I decided to make the sweater this way, instead of having a bunch of parts to seam up. The underarm seaming was enough for me, even though I love the magic of kitchener stitch. 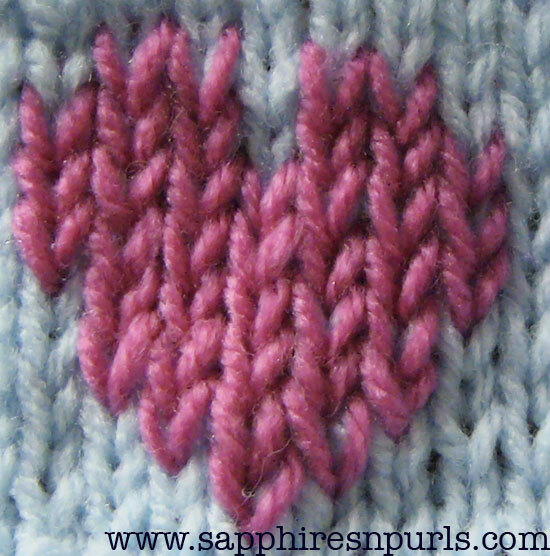 Duplicate Stitch is a super easy way to embellish and add color to your knitting. All you need is a yarn/tapestry needle, and a different color of the same yarn you used for your project. Preferably the same, or at least the same weight, of yarn. This really isn't set in stone - feel free to experiment with different types of yarn if you like. Just do a small swatch in the yarns of your choice to see how you like it, before going right to work on your finished item. If you decide to use a different yarn for your motif, keep in mind that if you plan on laundering your item, the two yarns should have the same laundering requirements. 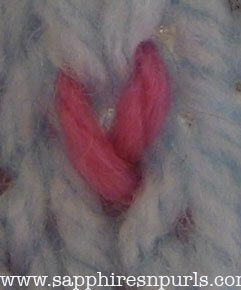 Here are some photos, and a video of duplicate stitch. You can chart out your own design on graph paper, or try taking a look through a book such as the Harmony Guides Colorwork Stitches, or Vogue Stitchionary 3. Basically, duplicate stitch is just tracing or covering up your stocking stitch Vs with another yarn. For your first stitch, you will want to leave a short tail, about an inch, and hold it in place with your finger while you finish the first stitch, just to make sure the yarn doesn't get pulled all the way out. While doing the heart in my sample, I worked from left to right on the first row, then right to left on the row above, and so on. Try not to jump around here and there too much, in order to keep the back of your work as neat as possible. 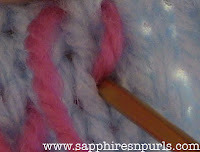 Also, don't pull too tightly on your yarn, as this will cause your fabric to bunch up and it won't look pretty at all. To weave in your ends when you are done, just tuck the tails under a few of the stitches on the back of the work. Come up at the bottom of your V.
Cover the right leg of your V. Slip your yarn needle under the two legs of the V above the stitch you are currently working on. Cover the left leg of your V. Push the needle down into the same spot you came up at in Step One. You have now made one duplicate stitch. Repeat this process until you have drawn your motif onto your project. If you make a mistake, it is really easy to fix. Just work the steps backwards to remove the stitch(es) you don't want.